Say good-bye to muriatic acid etching and all it’s problems! 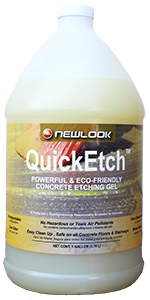 NewLook QuickEtch is a biodegradable concrete etching compound specially designed to etch concrete floors, both green (fresh) and mature concrete. The depth of the concrete etching achieved with this product is the same as hydrochloric or muriatic acid with 80% less odor and a more uniform etch than liquid concrete etching materials. 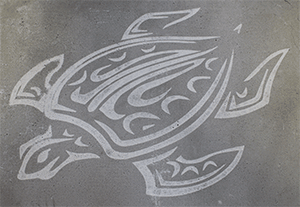 Use QuickEtch with Modello’s easy to-use decorative masking stencils to etch a non-slip decorative concrete pattern. The longer you leave QuickEtch on the suface, the deeper the etch. 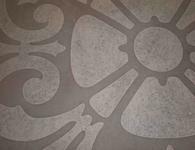 Want to learn how to etch concrete floors? Join us at a product demo training. 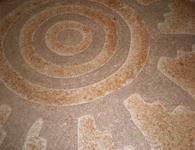 EcoAcid is primarily used to clean the surface in preparation for staining with concrete stain. It will (slightly) etch a non-porous substrate, especially when compared to QuickEtch, which is used to “acid wash concrete” by thoroughly etching your concrete and completely opening the surface pores in preparation for concrete stain. Apply a thick, even layer of QuickEtch (as determined from a test patch) using a brush or decorative / texture roller and fully cover the concrete. 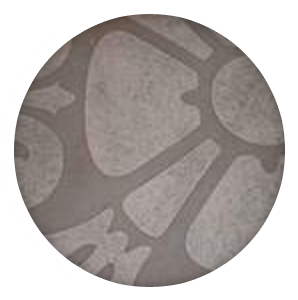 Concrete etching will begin immediately upon contact with concrete floors. Allow 10 to 15 minutes of contact time. Agitate with a stiff broom, nylon brush, or back roll surface to introduce the unreacted QuickEtch to the surface. Allow an additional 10 to 15 minutes contact time. Additional back-rolling will increase the depth of the profile. Apply additional QuickEtch if gel begins to dry out prior to achieving desired etch. Pressure wash or rinse with water while scrubbing with a stiff brush to neutralize and expose etched concrete surface. Pressure washing concrete floors is the recommended method of removal as water will neutralize QuickEtch upon contact. The time required to etch concrete depends on the type and age of the concrete. Most concrete will be sufficiently etched within 30 to 40 minutes. Rinse QuickEtch off concrete floors as soon as an adequate etch has been achieved. Additional applications and contact time may be required for high strength concrete (above 4000 PSI) or dense concrete. As with any etching compound, it is advisable to check the pH of the substrate before recoating to ensure that it is compatible with the new coating system to be applied. 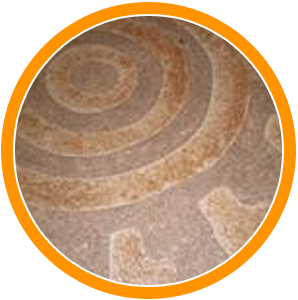 After sufficient drying time, ensure that the concrete floor is sufficiently dry and dust-free prior to recoating in accordance with good decorative concrete staining practice and the coating manufacturer’s instructions.